… The final example of an engineering achievement worthy of the title ‘built to last’ comes from the 1970s, the Deep Stream Water Supply. Water supply has been a major problem to successive City Corporations and Councils for most of the city’s life. We have a modest rainfall with lengthy dry periods every few years, and very limited space to store water to cover such dry periods. Run-of-river sources are a long way from the city so are very expensive to use. The City lived a hand-to-mouth existence for its water until well after the Second World War. In 1956 the City tapped the river gravels beside the Taieri River at Outram, and this gave us adequate water for the next twenty years. However by the late 1960s it was clear that another major supply would be needed to cope with the ever increasing demand for water. The search was on again for more water. In the early 1970s the options had been narrowed to two. More pumped water from the Taeri River, or a gravity supply from Deep Stream in the Lammermoor Range. The Deep Stream scheme had been proposed by City Engineer J G Alexander in 1930, but it was rejected by the Corporation at that time as too costly. The more modest 1936 Deep Creek scheme was built instead. However, detailed survey plans of the 1930 Deep Stream scheme were held in the City’s records, and an Act of Parliament in 1930 authorised the taking of water from the Deep Stream. It comprised some 58 km of pipeline falling from an intake at 425m above sea level to Mt Grand at 300m above sea level. A treatment plant at Mt Grand would be able to supply water to almost the entire city. The choice between the two options was made on the economics. Deep Stream was very high capital cost but low operating cost (no pumping needed). Taieri was relatively low capital cost but high operating cost (requiring electricity for pumping). In the event the Deep Stream option was approved by the Council in 1972 and it was completed in 1977. Just after the decision was made, the first oil shock in 1973 occurred and huge increases in energy costs resulted. This markedly increased the advantage of the low-energy Deep Stream option, and is reflected today in our relatively cheap water charges. The Deep Stream Scheme was forecast to meet the City’s water needs till the early 1990s. In the event the Burnside Freezing Works, a heavy consumer of water, closed and population did not increase as much as expected so the water supply system, including the Deep Stream Supply, is still meeting the demand, indeed is supplying areas of the post-1989 amalgamated city not envisaged over 40 years ago in 1968 when the demand forecast was made. Deep Stream was certainly built to last! It cost some $6.2 million (($55.1 million today). Extracted from: Otago Settlers News, March 2010, Issue 104, In the Pipeline. Engineering Feats Beneath Our Feet. Trevor J Williams, BE FIPENZ MICE MNZIS NZIM, former Dunedin City and Drainage Engineer. This large outcrop probably had significance to Maori given its dominant presence. It would make an ideal lookout of the coast over the treetops. The hills east and south of Maori Peak were rich resource zones where forest resources such as timber, foliage, berries and birds, especially Kereru (pigeon) and tui were taken. Young stems from mature cabbage trees were steamed for up to 48 hours in large earth ovens (umu ti) to obtain the sucrose from the fibrous centre of the stems. Several umu ti are known to survive in the Seacliff bush today and some may remain unidentified in the field. Keep your eyes open for a generally circular pit of 4-5 metres across and with a raised rim around the edges. Some are up to a metre deep. – Notes by Brian Allingham. Archaeologist. January 2010. This general area has high spiritual values and is reputed to be the abode of ancestral beings, some of whom have been seen in modern times by local Maori; thus perpetuating historical references from the 1800s and earlier. Little is known or understood of these beings, other than the perception that they are regarded as Kaitiaki or guardians. It would be wise to respect the area by not eating or drinking on Maori Peak or around the immediate base. – Notes by Brian Allingham. Archaeologist. January, 2010. Erosion has removed much of the evidence of former habitations along the beach. These were probably unfortified settlements that could rely on the defended ground at the pa if need be and would keep such a place on standby. One such place is Te Pa Hawea the “Yellow Bluff” about which little is known. It is attributed to the Hawea people who were connected to and gave name to Lake Hawea. This ancient connection lives on today through whanau who whakapapa back to these people. The smaller settlements along the beach date from a relatively early period, and probably supported one or several whanau thriving off relatively local resources. It is know from later records that coastal groups of people would gather at a locality on the coast before heading inland on seasonal hunting expeditions, when large amounts of eel and weka flesh were taken and preserved. Connections were also maintained with related inland populations, thereby sharing resources. Ben, a gardener of repute in Dunedin at the turn of the century, owned and farmed land at the top of Rudds Road, from 1890 to 1919. In 1919 he sold his farm and retired for a short period to Dunedin city. Finding urban life unbearable, in 1921 he purchased a 45 ha block of land on the northern flank of Flagstaff and lived on this property until he died in 1930 at the age of 76. Ben was intolerant of trespassers, claiming at onetime that up to 100 trespassers a week were causing him considerable annoyance and damaging the property. In 1923 a party from the newly formed Otago Tramping Club was “warned off” by Ben Rudd. One of those in the party descried “the feelings of alarm as they encountered the stocky bearded little man with the shot-gun.” Despite the initial antipathy, Ben Rudd eventually established very good relations with the club. To help prevent further trespassing the Club paid him £5.00 to cut a track round his property. Ben Rudd died in 1930 and his property was bought by the club in 1946. 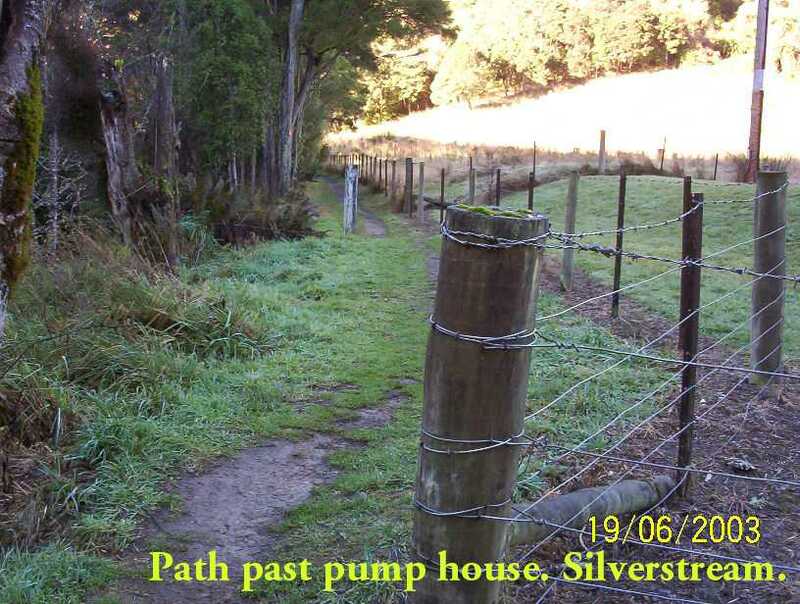 The club’s committee learned only by chance that the Rudd property was available, significantly, as it was probably the only property in the area not already owned or spoken for by the Dunedin City Corporation. The transaction, although undertaken by the committee without reference to the general membership was enthusiastically endorsed at the next AGM. The money for the purchase was loaned by Mr W Stevenson, who later refused to accept repayment; a generous gesture that has long been appreciated. – From the clubs Friend of Ben Rudd’s Certificate. Mt Flagstaff keeps vigil on our city. In time of rain it hides away. Settlers knew the area, one more so than most: Rudd by surname and solitude an aim. Before exile, the English-born migrant learned his craft well – from all accounts. Dunedin Town had no better gardener. After first urban years Ben Rudd settled 40 acres at Flagstaff where a byway signifies his title. Any dwelling has gone, though relics are visible. Picture a wee man living rough up yonder, wild pig as meat for the pot, with a rabbit or two when empty; like hermits of old, contented alone. Farm development kept Mr Rudd busy in mid-life. Stock were grazed instead of tillage, for nature could zap the best of crops. Snow lay early on Flagstaff and often stayed late. While horse and foot were modus operandi people riled him less, but as Dunedin grew and travel improved bother came along. Legends tell of youth driven off by an ancient scattergun fired at random; also of a rare journey from Kaikorai Valley to the “smoke” by cable car. Pint-sized Ben fell out with a mammoth Edwardian dandy; temper ablaze he swung on the man’s watch chain, kicking shins like a demented elf! Photographs reveal Ben’s Place lay near the summit route, which could often bring intruders. An assault and trespassing lawsuit of 1907 confirms the trend. On finding a picnic circle with billy aglow Ben took offence – combat with a younger bloke left him second best. Later court action yielded a shilling and costs were allowed. This highlighted years of hostility on access matters. Much dirty linen was aired in court of prior violence. While oft provoked Ben had an obsession about his rights worthy of King Canute. Increasingly unwell he battled on for another 12 years, selling in 1919. Life in Dunedin had less appeal, however, and 18 months saw him back at Flagstaff camped near his late abode. Illness finally overtook him at the public hospital. He died in February 1930, aged 76 years. 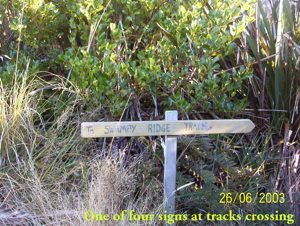 Tramping Club members are said to have tended his old patch for some time after. Footnote: Eighty-odd years ago much of Flagstaff and Whare Flat comprised small farms. These have since been purchased by the city. You can wander safely now, apart from trail bikes! – Dunedin Star Midweek,24/5/1995. Community News. Peter McLauchlan’s Sketchbook. With Bill Brosnan. Installation and Dedication of the Linda Mercier Memorial Seat. The crowd met on Saturday 20 April 2002 at the Bullring and made light work of carrying the materials pre-built by Peter Mason to Ben Rudd’s hut site. A contingent from the Merciers arrived at lung time to catch the last of the installation process for the large durable seat. Everyone, including the children, helped, and a track was put in to the site, which will command a spendid view from the beech trees. Old Ben eased back to rest on the slope beside his home and wipes away the sweat from his face. Funny how snowgrass seedheads are always tickling your face no matter where you sit, he thinks, as he watches the sunset glow extending right over Silver Peak. Crunching the last of this year’s gooseberries from his garden, he thinks of the stupid boys from school a few decades ago who taunted him about his size, who made him just want to spend his life alone. No pests up here in his little piece of heaven. Time to turn in. More track cutting tomorrow for those trampers, he thinks, then I’ll put on my best jacket and go into that blasted Dunedin for supplies. He hangs his rough old coat on the three-prong coat hook screwed into the rafter by the door, gets his fire going from the lunch-time embers and begins to cook up his tea. This lis life, he thinks. Day to day peace. Old Ben has gone, but his home remains, lovingly maintained by his old friends in the OTC. They never ever got to really know the old chap, but they all admired him. There’s a bit of broom climbing the hill into the tussock. SOmething Ben would have see off. “All in a day’s work” as he would have muttered to himself. It’s a pleasant day and the place is peaceful as usual until two stupid boys from school show up among the tussock from the Flagstaff summit. “Hey, nobody around. Let’s have a look inside to see if ther’s any gold. The old hermit was probably a miner.” “Don’t be stupid. No gold here.” “Hey, look at the old coat hook up on the rafter. Bet I can swing on it.” There’s a groan of timber, and the old rafter begins to shift. The old man’s home can’t stand too much of this treatment. Luckily for the rafter, the screws in the three-prong coat hook let go and the kid falls, laughing, on the floor, although he’s hurt himself. The other one, having fnished carving his hame, is really amused. Great to see someone else hurt, eh? The boy gets to his feet and yells at the coat hook in his hand as if his fall was all its fault. He steps outside. Flings the offending article up the hill into the flax. Just another work day by those trampers and mountaineers from the OTMC. It’s still a peaceful spot, although the stupid boys from school still cannot leave Ben alone. They have tried toburn down the shelter that replaces his home, and continue to leave their names and obscenities as only stupid boys can. It’s a working party today, though, in a group that bears his name with pride: “The Friends of Ben Rudds”, installing a seat at the point where you can still see that treasured view of Ben’s. It’s misty, but the folk caatch a glimpse of Silver Peak every so often. One of the workers, digging out a hole for one of the four seat legs, uncovers a three-prong coat hook from among the broom roots … and, wiping away the sweat from his face, wonders about its history. The shelter site with Linda’s seat, Ben Rudd’s house site, the Bruce Campbell beech trees and the remains of Ben’s garden is of interest …. The majority of the beech trees were planted and more pig damage to former plantings was undone. The ground in fromt of the Linda Mercier seat was raised and secured and the Shelter’s fireplace with its concrete slab was demolished and/or buried under soil and turf. The shelter was cleaned out. Some of the worst snow damage on the track was tidied up. A permit is required for every fire on the property, including any billy-boiling at the shelter. One evening recently a group of boy scouts visiting Nicols Creek was privileged to see the 17m high waterfall illuminated misty white by the light of myriads of glow-worms occupying the surrounding walls. 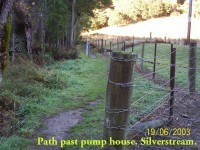 Nicols Creek is a shady bush streamlet that formerly entered the water of Leith just above Woodhaugh, Dunedin. The water is very pure and is piped at the lower end and connected to the Dunedin water supply. A short way into the valley the streamlet drops over four large waterfalls. The first is pretty and quite spectacular – a sheer drop over a high moss-green wall of rock surrounded by native forest. After dark there is a spectacular and beautiful display of glow-worms on the walls of the first gorge. Glow-worms also occur in fewer numbers within sight of the falls. (The large numbers present during our recent visit was unusual). Last century, this waterfall was one of New Zealand’s better-known scenic attractions. Today it is virtually forgotten. This is a good thing in some ways because it has enabled the native vegetation to revert to almost its former condition. The light in the glow-worm Arachnocampa luminosa, is produced in the tail of a legless fly larva. The larva lives inside a flexible tube to which are suspended 20 to 40 threads strung with sticky globules that resemble a string of beads. These are “fishing lines”. Small flying insects such as gnats, attracted to the glow-worm’s light, bump into the hanging threads and get caught. When it feels the tug, the glow-worm glides along its tube to the relevant line and quickly draws it in. It eats the insect rapidly. Glow-worm eggs are small and spherical. The larva emits a bright light immediately after it hatches from the egg. It finds a place to build a tubular nest, then lets down sticky fishing lines. After about nine months when it is 30mm long, it changes into a pupa. The pupal period lasts from 12 to 13 days. All stages except the egg can glow. – Nature file, Otago Museum, Anthony Harris, 16/5/1994. Newspaper cutting. Left: Taieri Recreational Tramping Club member Jack Merrilees with some material for the track. The Ministry of Youth Affairs Conservation Corps based with the DOC filed Centre in Dunedin has been making steady progress on the boardwalk to the Leith Saddle. 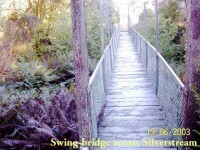 When completed this boardwalk will be about 1.6km in length and pass through unique forest featuring miro, rimu and the mountain cedar. The logistics of carrying the timber up the ridge to the work site is a major obstacle to speedy progress. 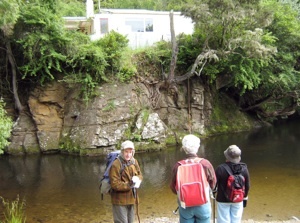 Recently however this task has been made lighter through the voluntary efforts of some local tramping clubs. 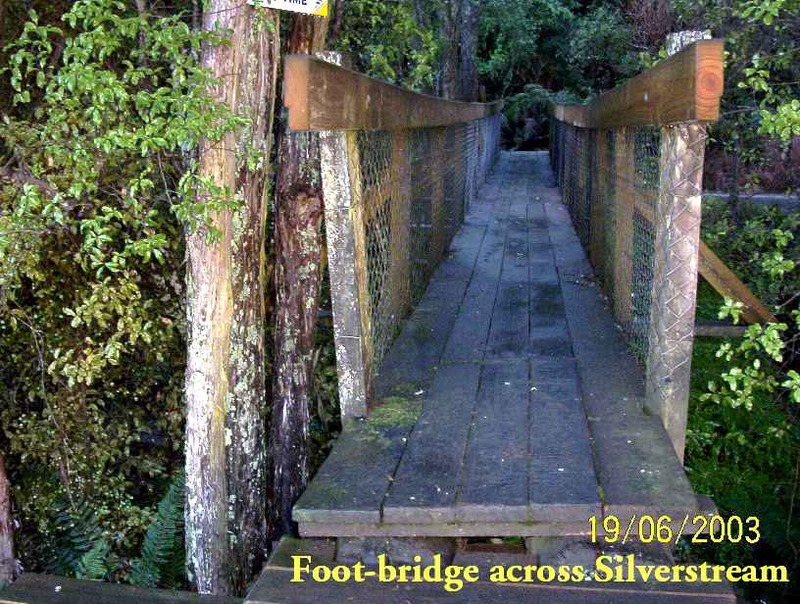 The corps is especially indebted to the WEA over 50s tramping club and the Taieri Recreational Tramping Group members who carried tonnes of timber up the boardwalk to the work site over two work days recently. runs between Alexandra and Roxburgh. Depending on how far you want to travel along the walk and how much time you want to spend exploring the gold workings, the route can take anything from half a day to an overnight trip. The walk is a round trip down Lake Roxburgh and returns via Shanty Creek and the original Knobbie Range road from Roxburgh to Alexandra. No special equipment is needed apart from good walking shoes, a day pack with food and drink and a parka. The walk is unsuitable for young children and the not-so-able. 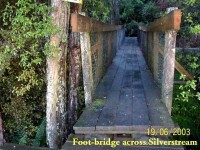 To get to the start of the walk, cross the road-rail bridge from Alexandra and walk south to Sanders’ Orchard. Walk around the orchard’s top outside fence to the old Graveyard Gully pioneer cemetery where you will see the walk. The track follows an old bridle track for the first few kilometres, and there is a similar bridle track with reveted rock walls on the opposite bank. These paths were constructed in the 1880s to supply coal to gold dredges working the river. In the first 4km to Butcher’s Point there are only a few rock shelters and huts, most in a ruined state. The vegetation is mainly thyme covering the rocky slopes, and also some sweet brier and matagouri. Poplars mark the locations of early habitation sites. Just before Coleman’s Creek, the track comes to two huts, “leaky Lodge” and “Mary Ann’s”. Downstream of the creek is a complex of tailings, water races and rammed earth and stone dam. The Coleman’s Creek workings make a good turning-back point for walkers with limited time and energy. About 1km below Butcher’s Point is the Narrows, which used to be the site of a big rapid in the river. Beyond this the river widens out to the Island Basin. There are numerous rock shelters and stone huts in this section of the walk. One of the more notable is “Jimmy Richardson’s” at the end of the Island Basin. A puzzling feature in this area is the large concrete posts set at regular intervals down the gorge. These mark the location of profiles of the lake bed, used to measure the amount of silting of the lake. Next a bluff falls into the lake, and the route traverses a series of ledges and aimal tracks through this bluff. The “Maltese Cross” cottage is the next hut, located in a grove of tall poplars. Behid this is a rock shelter known as “Blackman’s Cave”. At least two hours are needed to explore the Doctor’s Point workings. The area was originally worked in the 1880s and again in the 1930s when the Government introduced a subsidised relief scheme to grubstake gold mining. Many of the original huts and rock shelters were upgraded by the 80 minders who worked the gorge during the Depression. The lower workings consist of a formation of parallel stacked tailings. Water for the sluicing was conveyed to the site by two stone races from Shanty Creek. Above the workings is a rammed earth holding dam with stone buttresses that looks like a fort viewed from the lake-shore. Near the lake are three stone huts, still in good condition. Upstream is an eel-smoking chimney. The upper workings consist of tunnels (now collapsed) with their spoil dumps and tip heads. A cable-way, steel rails and a wooden slide remain. There is also a blacksmith’s forge site. Past Doctor’s Point at Shanty Creek is a hut that sleeps four. From the hut is a four-wheel-drive track that meets the old Knobbie Range wago road. This was the original road between Roxburgh and Alexandra before the present west bank route was constructed in the 1870s. It is impossible for ordinary cars. From the Shanty Creek ford the track climbs up to a plateau of rock-strewn landscape. This is the dry heart of Central Otago, stark and barren to some, but with its own beauty. It is certainly a unique landscape. Over the top, the track drops 400m on a gentle grade back down to the graveyard. There are extensive views of the Clyde-Alexandra basin from the track. It is easy to imagine the excitement of the “diggers” in 1862 when, after an arduous journey from the Tuapeka, they came across the same view of the Dunstan goldfield. Lower down, the track passes through a belt of rabbit-devastated country with bare eroded ground between circular mats of scrubweed.